Most property management companies only target a single type of buyer, but there are 3 different types of buyers out there. This means most property managers are leaving money on the table and losing out on sales. 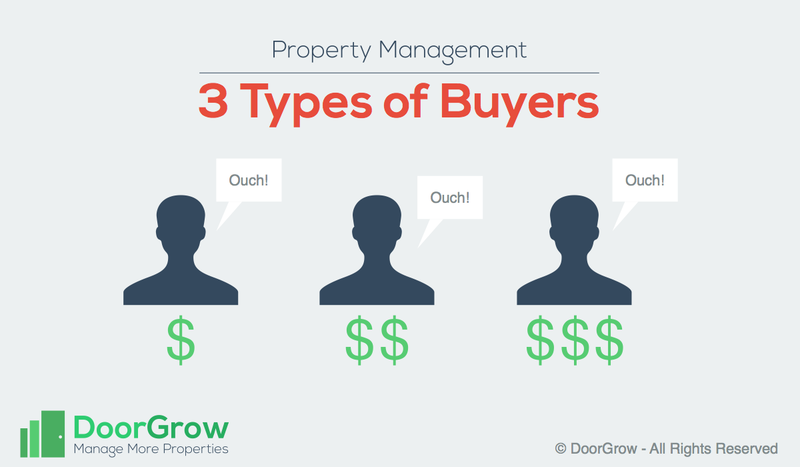 Here is how you can make more money by targeting 3 different types of buyers. Property management pricing strategy involves learning several core principles. One of these is that there are different types of spenders. Understand that everyone spends until it hurts & everyone has a different threshold of pain when it comes to spending. Cheap! Cheep! Cheep! Spending any money is painful to these birds. You know you are targeting this group if you compete aggressively on price and strive to be the lowest-priced firm in your local market – like the low flat fee firms. Strangely this group attracts and endures more pain than others in order to save a buck & avoid the pain of spending. Most buyers out there, roughly 61%, are willing to spend money if it makes sense. This is the group to sell on benefits and features. Premium buyers are those that buy the best. They are willing to spend more to get more. They buy the better digital camera, the premium pizza, the premium beer at a pub. They just spend and spend until it finally starts to hurt a bit. This is usually the smallest group – about 15% or less. I love these clients – by the way, if you are one of these, let’s talk – I can keep coming up with great ideas and you can keep throwing money at me… we both win. It is important to realize that property management, by its very nature, is a premium product. In general, the cheapos will usually do things on their own and won’t seek out a property manager. So my guess is that most property management companies targeting normal buyers, have in their client list, several premium buyers… probably more than 15%. This means, by not having a price & package to offer to your premium clients, you left money sitting on the table, so they went with your normal rate. Just make a list of everything you do normally and then figure out which items you can do more of, or ask yourself “what additional services could we put into a premium plan?” One great method? Get feedback from your clients. Just ask them, “What do you wish we offered that you would like to pay us to do?” What problems or burdens are premium buyers more sensitive to? What about the cheapos? If you aren’t targeting them currently, you might want to start offering a “lease-only” plan, or “tenant placement” package. Getting a tenant – marketing, screening, etc. may be one of the most painful steps for the cheapos. Remember, where there is pain, there is opportunity. If you really are only interested in selling more of your normal offering then realize that you will sell more normal contracts by having the higher and lower packages as options. People like options, plus they need context. Being able to see multiple prices, side-by-side helps them make a decision. It also helps to eliminate their need to compare your prices with others. If you only have a single rate, they naturally will want to get context and compare it with your competitors. Instead of choosing between your price and your competitor’s price, let them choose between your 3 prices. Plus having plan for the cheapos means you can always up-sell and convert some of your cheapos into normals. Once you have them as a client, you can always sell them more. If you make your premium offering enticing enough you may even be able to convert some normals into premiums. What Pricing Strategy Questions Do You Have? Ideas? So you found this pricing strategy stuff pretty tasty… we’ll write more on it in the future. What questions do you have about pricing strategy? What ideas have you found useful? Be sure to comment & let me know.